Master and Commander Style Naval Cutlass. This model is being discontinued once these last two are sold they will no longer be available. The 19th century was a time of intense strife between pirates and those who hunted pirates. 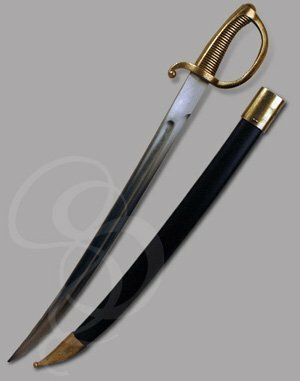 This saber captures the historical appearance of that time: a time when privateer and navyman alike carried sabers like this. This style has been popularized with the 2003 release of the movie "Master and Commander," directed by Peter Weir and starring Russell Crowe. A great movie based on an even better series of novels by Patrick O'Brian. If you're looking for a weapon similar to the ones used in that movie, then this is your saber. This style of saber was perfect for ship-to-ship combat. The slim handgaurd was both stylish and efficient; although it did not provide as much protection as the full bell guard of previous centuries, the thin guard allowed for more refined finger work and was a better fit on the hip that the bulkier bells. 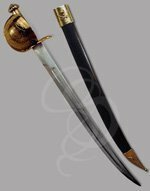 This cutlass features a metal alloy blade which looks quite nice and can't be sharpened. It has a solid, embossed cast grip and guard, with a delightful flared end on the gaurd (yeah, we actually used the word delightful. Get over it). 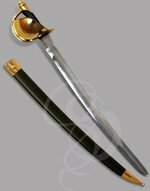 It comes with a leather-wrapped sheath with brass accents at the throat and tip. Buy now and take command of your destiny (or insert your own cheesy tag line here if you prefer, gentle customer. It's not easy thinking these up, you know).